The race was open to adults in a main stampede, while youngsters took part in a 400m run. The winner of the main run was Leila Armoush, who runs with Leeds City Athletics Club, with Jonathan Gallucci, from Bingley Harriers, finishing a close second. Daniel Pelissier took third place. Over the years the Reindeer Stampede has raised over £40,000. This fantastic total enables Epilepsy Action to improve the lives of people affected by epilepsy, not only locally but also all over the UK. 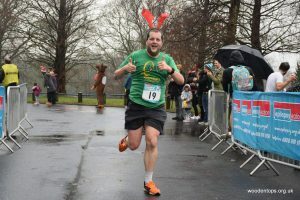 Phil Lickley and Louise Hayton travelled to Lister park to take part and thoroughly enjoyed themselves. Well done and sorry to Louise I could not find a photo of you.